Grime, muck, grunge, and grease. Sure, they’re great sounding words, but they’re all tough to remove from surfaces. When you want to sanitize an area, do you use hot or cold water? What about scrubbing dirty dishes? When trying to remove stains from clothing, do you select a hot or cold rinse? No doubt you answered hot all three questions. When you have greasy stained surfaces, a heat setting makes sense for dishwashers, washing machines, and other household appliances. The same is true for pressure washers. Hot water is just more effective at removing stains. Why? The hotter the temperature, the lower the surface tension of water. Hot water contains fast moving, or excited, particles. This means the molecules spread apart, making it easier to expand and then loosen a stain. In addition, hot water can more quickly cut through grease and it effectively kills bacteria and microorganisms. Construction – Big digger and excavator machines are required to do some dirty jobs. The result is a build-up of mud, grime, oil, and grease. A hot water pressure washer makes quick work of hard-to-remove caked-on mud and grime. Food industry – Restaurants and wineries must meet enacted standards to pass inspection. A hot water pressure washer can be used to properly clean and disinfect many different areas, including the floor, kitchen hoods and ducts, outdoor seating, and dumpster/waste areas. Hot water cleaning also requires less detergent, saving you money and protecting the environment. Rental property – Need an effective method to clean the exterior of your rental properties? A Mi-T-M commercial hot water pressure washer is just the ticket. You can mount or transport one of our units in the back of a truck, or pull one of our trailer units. Then the washer becomes a portable cleaning machine. For decks and driveways, use our superior rotary surface cleaner. Manufacturing – If your products leave a mess on the shop floor, our industrial-grade pressure washers can blast away the mess left behind. You can also take advantage of our many pressure washer accessories to target specific areas of your facility. Trucking – Big rigs return from time on the road covered in crud, muck, and filth. But you have a secret tool in your arsenal, a Mi-T-M hot pressure washer. A hot water cleaning can take care of any cleaning concerns. And you can use it afterwards to clean your shop floor too. Waste Management – Garbage and recycling trucks can’t be choosy; they must pick up everything. That’s why these machines need thorough cleaning and disinfecting. Hot water pressure washers can remove grease and caked-on dirt quickly and effectively. As you can see, there are many benefits of hot pressure washers. No matter what kind of business you run, we know you’ll appreciate the strong power of our equipment. At Mi-T-M, we manufacture product in our nearly 1 million square-foot facility located in Peosta, IA. Once you purchase a product from Mi-T-M, we want to be sure you know how to properly use it. Check out our many training videos to learn more. We’re proud of our high-quality hot pressure washers and know they’ll help save you time, money, and stress. Contact Mi-T-M today. 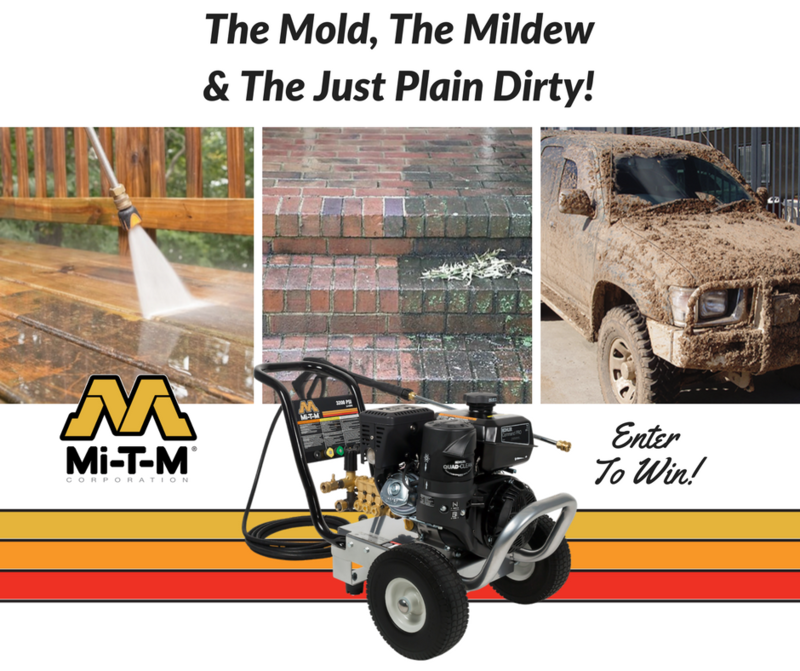 Mi-T-M’s Spring Cleaning Contest – WIN a Pressure Washer! Enter for your chance to make spring cleaning quick, easy, and fun! Spring is just around the corner, and we want to help you clean your dirty stuff with a NEW 3200 PSI Work Pro® Series pressure washer featuring a KOHLER engine! The Spring Cleaning Contest starts March 15th and runs through April 15th, and all you have to do to enter is like our Facebook page & submit a photo in the comment section of the dirtiest thing you would clean using a pressure washer. A winner will be selected at random and announced on April 16th. Think of all the uses you have for a pressure washer, especially during this time of the year. Not only can a new washer clean all the items that have been collecting dust while in storage for the winter but will also make larger projects a breeze when you’re ready to tackle them. Washing your siding, sidewalks, garage floor, vehicles, toys, and more will be easier due to this units’ power capabilities. This unit includes quick connect nozzles – 15º, 25º and a detergent nozzle, as well as a 25-foot x 3/8-inch wire-braided high-pressure hose, a professional-grade trigger gun, a two-piece, 36-inch lance and an efficient Kohler engine that will produce all the power you’ll ever need! Designed to easily handle tough cleaning jobs, the WP Series is great for blasting away mud and muck and is great for cleaning jobs on the farm, around the home, or at a small business. The Mi-T-M Work Pro® Series pressure washer features dynamic settings that allow you to wash a variety of surfaces, from something as hard as concrete to something as soft as vinyl. Because it’s mounted on an extremely strong frame and has wheels, the portability of this pressure washer is easy for every user. If you’re hosting a grad party, bonfire, bbq, trying to sell your home, or anything in between, you can definitely use a pressure washer to make the job easier and see better results. Don’t wait! Take a few minutes and enter now on our Facebook page. Good luck! Dealer Spotlight: Alklean Industries, Inc.
Alklean Industries, Inc. has been in business since 1971 and has made it their mission to help clients achieve peak profitability by giving them the tools to operate more efficiently. A testament to the customer loyalty they’ve cultivated over the years is the simple fact that it was these loyal customers that pulled them through the recession-inducing oil bust of 1987. Based out of Pasadena, Texas, Alklean is a leader in industrial cleaning systems and wash water recycle systems. Their humble beginnings featured only a handful of employees and a facility less than 5,000 sq. ft. Today, they’ve grown exponentially into a team of 20 employees who have a minimum ten years with the company and a building of over 17,000 sq. ft. to roam. Under the leadership of John and Brenda Purswell, all employees feel like family. This longevity is proof of the professionalism and dedication they provide to customers and each other. Everyone at Alklean is incredibly proud of Brenda, also a principal shareholder, for earning woman-owned business classification for Alklean. Alklean offers products and services that meet the needs of customers from a wide range of industries. Such as oil field related companies, refineries, construction and manufacturing companies, municipalities, schools, contract cleaners, trucking companies, plus timber and farming and ranching businesses. Alklean serves the Greater Houston area and has a loyal customer base that spans the United States, Mexico, Trinidad, Canada and Puerto Rico. The Alklean team realizes that customers can purchase cleaning equipment and water reclaim systems from many different companies. However, the expertise to select, install, and service the correct equipment for the clients’ application is what makes Alklean unique. 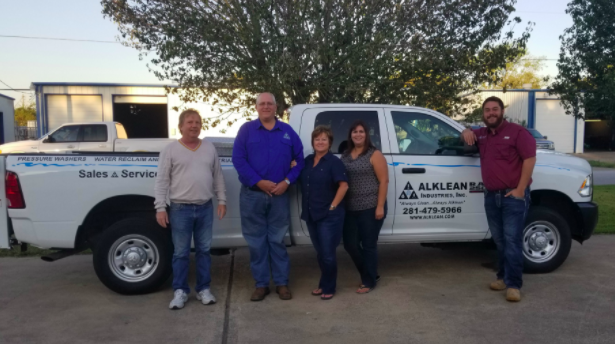 Customers can put their trust in Alklean’s high-quality equipment, professional staff, and outstanding customer service, which is what puts this business in the Dealer Spotlight. “The word ‘partners’ comes to my mind when I think of Alklean Industries. Both John and Brenda Purswell have been very instrumental in building our dealer network. 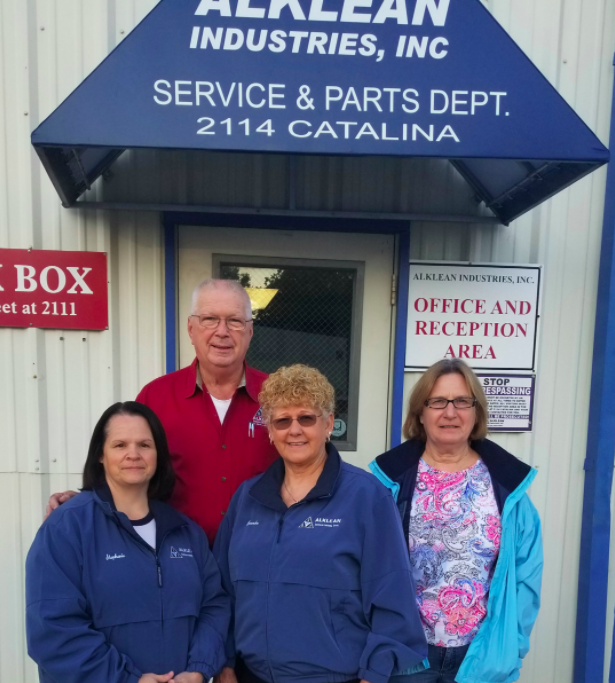 They have always been a great sounding board and, better yet, shared real-life experiences to help make us a better company,” states Karl Loeffelholz, Mi-T-M Distributor Division Manager.